The safe disposal of sharps waste is a very important part of managing the possible dangers from a range of substances. 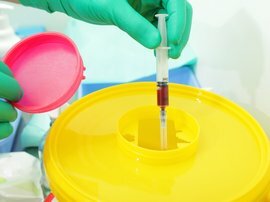 There are also very firm regulations in place around the disposal of sharps and this is why most businesses outsource this to an expert. TWC Group works from Lincolnshire and Yorkshire to the North East of England and offers our expertise to arrange the collection and disposal of sharps from a wide range of businesses. Our service means we can help you organise the right bins for the different waste generated within your business to ensure the risk to staff and customers is as minimal as possible. Our service is used in businesses as diverse as tattooists to chiropodists, general practices to beauty therapists and much more. Our plans mean everyone knows where to dispose of the different types of sharps within the business in any situation. We provide a waste transfer note at each service for you to show that the business is dealing with this waste correctly. Our service also includes the incineration of sharp bins in accordance with the latest regulations. The service is a flexible and discreet one that can be set up for regular collections or occasional ones, depending on the amount of waste generated by your business. Your local sharps disposal service provider. We provide our full range of sharps disposal services across the whole of North Yorkshire, East Yorkshire, West Yorkshire and South Yorkshire, operating out of our locally based depots situated in Hull and Thirsk. Our sharps disposal services in North Lincolnshire include our full offering and covers locations such as Scunthorpe, Grimsby, Brigg, Barton-upon-Humber and all the surrounding towns and villages across the Humber region. The sharps disposal services detailed are available to customers located in the North East region, including cities such as Middlesbrough, Durham, Sunderland, Newcastle, Gateshead and all of the nearby towns and villages.